I really never understood the idea of chasing the DP badge. Chasing this badge from what I gather entails driving long distances and hoping that enough shooters turn out to warrant a leg award. A time requirement is thrown in to not allow someone to earn the award too soon. I guess the wait time adds some kind of value to the award. Why bother with that when you can chase master and HM without the time constraints? It's not that I think making master won't take a lot of time, but it will be there waiting on you as soon as you can make it. Making it doesn't require a time speed bump and is independent of what your competitors score was Even when you do wait out the award, you are coming back to NRA bullseye. When I started this sport, I felt that the distinguished badge was the most challenging award I could get. I liked the concept that I was competing against similar equipment to mine and it isn't as much of an equipment war. Since then I've learned that it's really the shooter--and that if equipment was a factor that the equipment was pretty bad. I still see the badge as a worthy goal to achieve. The iron sights, the ball ammo--shooting like that is a challenge that has always appealed to me. 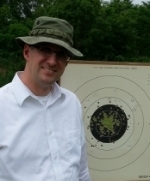 I want to join the fraternity of distinguished shooters who came before me. Master and High Master are achievements that I will pursue later. For me at least they are all the same goal, improving my shooting process to achieve a higher level of consistency and therefore performance. My focus is on a training program that gives me the results I seek. Both making Master and the DP badge will be a result of that process. To me it was always a leveling of the playing field where equipment and ammo and cost wasn't a determining factor in the end result. Almost every shooting sport has become a $$$$$ race. They are separate and different accomplishments. You are free to chase after whatever shiny baubles your heart desires. It differs based on locale and timeframe, but I made President's 100 first, then Master, then Distinguished Pistol, then 2600 Club, then Distinguished International, then High Master (15 years after making Master), then Distinguished Revolver. Still seeking 2650 Club and Triple Distinguished. Whatever gets you out to the range and competing is cool by me. IMHO The evolution of our sport has significantly changed the meaning of a Distinguished Pistol Shot Badge. The influx of the red dot scopes changed the EIC picture and the relativity to the straight 45 NMC. Those of us with military marksmanship backgrounds saw emphasis on Service Pistol and the need for that service specific Distinguished badge for our uniforms. GI hardball ammo was issued on the firing line. We were issued match tuned hardball guns that were the accuracy equals of our wadcutter guns. Team coaches would restrict new shooters to hardball ammo only to prepare them for Service Pistol individual and team competition. I started competing in 1979. Shot 45 ACP hardball in the centerfire and 45 matches until I consistently broke 2500. Remember shooting a 2557 the first time I was allowed to shoot wadcutter. Was awarded my Distinguished badge and made 2600 club while holding an expert card in 1984. The master card came in late '84. I kinda fell into it. I had just turned 24 and went to shoot my first match. I lived in San Diego and didn't know that San Diego was the mecca for shooting BE on the west coast. That December 1988 match had every active and reserve military team there. I remember walking up to the line nervous as hell because of all the uniformed shooters; probably close to a 100 competitiors. I made friends with Jimmy Radford from the US Army All Reserve Pistol Team. He was instrumental in getting me on the reserve team. October of 89 I was on the All Reserve team. I had already made Master. Got stuck in the 2590's and finally broke 2600 in June 90 at Interservice. I shot my first leg match there and got my 1st leg. Went to Perry 1st time in 90 and made Presidents Hundred and got 2nd leg. I broke 2650 in August 90. Perry of 91 legged out (took 4 matches). I was shooting lots of international and tons of BE matches. I never practiced hardball. There was pressure from being a military shooter to get Distinguished, but it was never really a priority for me. I was surrounded by Olympians (Reiter, Young, Fox) and that was really my interest. Hardball was just a by product to me of being a military shooter. I've never owned a hardball pistol. I shot a wore out Army pistol for my matches (reserve team got left over 2nd rate pistols from AMU) and I would only sight in before a leg match or nationals. It was easy for me because I never made a big deal out of it. When I shoot the 3600 in Phoenix at their Desert Mid-Winter matches in February I borrow a pistol for the 900. When I went Distinguished they were still issuing ammo at the matches. When I shot Phoenix last year and was shooting Winchester white box and getting a good reminder of RECOIL, I was disappointed to see majority of shooters using powder puff loads. So getting Distinguished wasn't really that important to me. I'm glad I did, but it ranks low on my list of accomplishments. The remark regarding time constraints is inaccurate. If your really good you can get your badge in 3 matches. That's less than 1 year. Making master for most shooters takes several years or never happens. Many Distinguished shooters out there who never make it above expert. So we all put a different level of importance on our shooting goals. I pistolsmith now and shoot 1 match a month with no practice. Right now that's enough for me. But I build a lot of ball guns and love doing that! Why? Because I'm building a pistol for someone who wants to be Distinguished and I get to take an active part in their chase for leg points. I also had the honor of building the ball gun for the 1st Double Distinguished Navy Woman! Man I love BE! All that has been said will now fall into the "how it use to be" as the new changes to the EIC will be totally different, any ammo, any gun and many seeping changes that will be announced soon will take away any desire I had to continue to shoot these matches. Id rather concentrate on making master. Difference between Expert and Master is trigger control! Think about it? As John B. pointed out, they aren't mutually exclusive. A leg match is an additional chance to shoot. Being able to put 270 or 300 good shots down range and do it well is like a marathon. Heck, I'm still working on getting 90 good shots down range. Jim Radford? That explains a lot. Jim and his wife Kim were regular competitors up here in the 80 and 90s. Good people. Axehandle wrote: Was awarded my Distinguished badge and made 2600 club while holding an expert card in 1984. I would have been 2 years old. 2 is a good age. What have you been doing the last 30? Borrowing from Jon's post, in all the years living in San Diego Bullseye was never on my radar. What a shame of opportunity lost. Toured most of the golf courses in the Southwest and played plenty of tennis matches in SoCal but never even owned a gun. And now, thought a static sport like Bullseye by comparison would be a breeze. I thought wrong. Golf courses=the waste of a perfectly good rifle range. Best new shooter I ever knew was a guy who came to the sport from being sponsored on the pro tour by ping golf clubs. He started bullseye and went from marksman to high master in 13 months. How to excel shooting Bullsye Pistol in 60 words by Ed Hall !! For the aspiring shooter, write this down, follow it, recheck it against your practice regularly or if in a slump. This assumes the shooter understands the importance of trigger control and seeing the dot/sights. james r chapman wrote: To me it was always a leveling of the playing field where equipment and ammo and cost wasn't a determining factor in the end result. Because all those G.I. looking guns all shot good at 50 yards anyway with no money put into them. Jon Eulette wrote: I kinda fell into it. I feel about the same way. I was shooting at the State Championship match in a nearby state when I was offered the use of a ball gun and ammo to get a feel for a hardball match and to "help somebody get a leg". I accepted the offer and to everyone's surprise including mine nearly got myself a leg. Needless to say I was hooked. I took the red dot off the Al Dinan .45 I was using in the regular matches and started chasing my own leg points. I got 4 points fairly soon and somewhere along the way got an 8 at my home state championship. 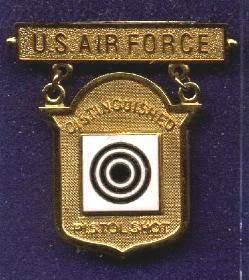 I got to 30 in my 2nd or 3rd year and made Distinguished without ever firing a shot at Camp Perry. Luck - picking which 3 matches to enter - does play a part in it. "Because all those G.I. looking guns all shot good at 50 yards anyway with no money put into them." You guys that believe that never had the opportunity to hold one of the "AFPG" guns that I shot EIC and Service Pistol with. These things were built with the same precision as the USAF wadcutter guns. I personally saw quite a few AFPG marked hardball guns converted to wadcutter with simply a trigger weight, recoil spring, and magazine change. Axehandle wrote: "Because all those G.I. looking guns all shot good at 50 yards anyway with no money put into them." You guys do know that Otiso was pulling your leg? Right? I read it as there is No way those fancy 1911s all shoot good without work. There are of course exceptions but they are not generic 1911s.